It’s been a while since you’ve been to Belize. Far too long, in fact. You miss its little islands surrounded by crystal-clear water. They sit atop the longest barrier reef in the Western Hemisphere. You miss the laid-back vibe. It forces you to slow down very quickly. And you miss the feeling that you’re so much further away than you really are. Even with a connection, it only takes six hours to fly to Belize City. Do you have enough reasons to start planning your next trip yet? If you’re still unsure, Thatch Caye should tip the scale. The beach resort is the only thing on the small island. It welcomes 30 people, max, at a time. 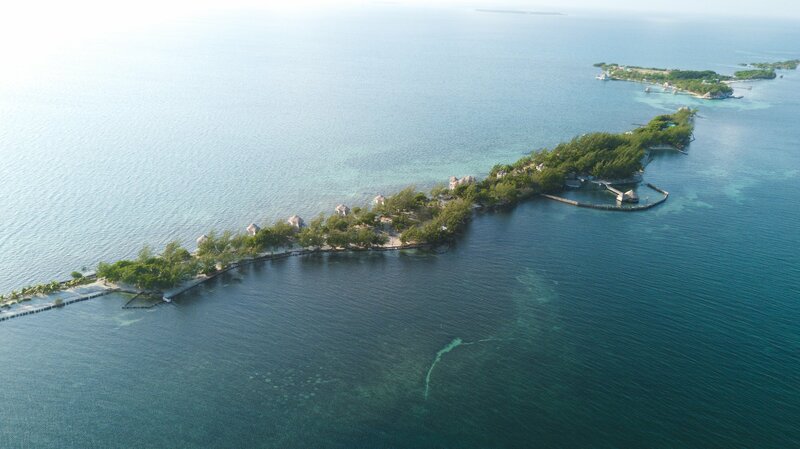 The island, one of three in Coco Plum Cay, sits eight miles off the coast of central Belize. A 25-minute boat ride from Dangriga is the only the way to get here. (Unless you have your own boat, of course). The cay is in the South Water Caye Marine Reserve, the largest marine reserve in the country. That’s part of the Belize Barrier Reef, whose size is only exceeded by Australia’s Great Barrier Reef. So after flying to Belize City, jumping on a commuter plane to Dangriga, and heading east into the Caribbean Sea, arrivals are met by Dewey, the island dog. He’ll lead you from the dock to the Coco Lounge. This is the social hub of the resort. 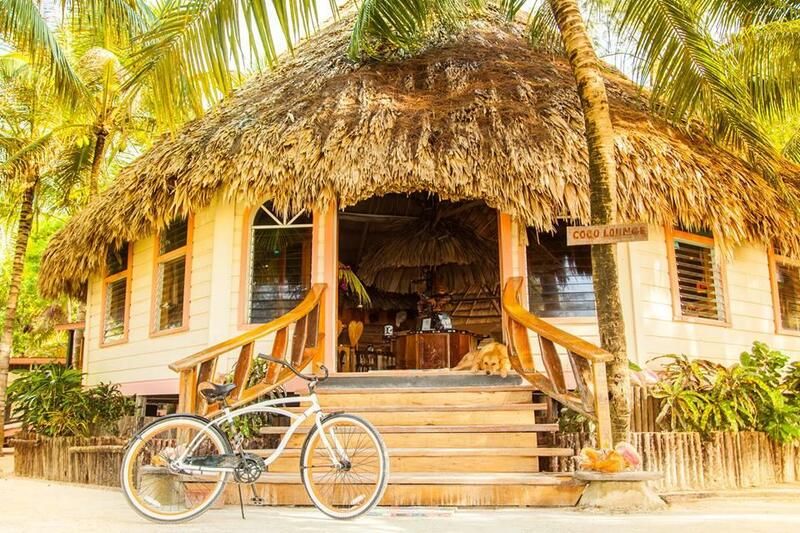 The thatched-roof building is where you’ll find early morning coffee, a breakfast nook with johnny cakes and tropical fruit, cocktails the rest of the day, and wifi when you really need it. The lounge is surrounded by mangroves. A sandy path in one direction leads to the Grove, where communal dinners are served on long picnic tables. The Rod Room, which manages fly and deep-sea fishing trips, and a tiny, open-air chapel are beyond that. The Scuba Shack, filled with snorkeling and diving gear, is in the opposite direction. If you keep going, you’ll end up on the yoga platforms at Serenity Point. Shades of teal, turquoise, and emerald peek through the palm trees no matter which way you look. That takes care of the center and ends of the island. Now onto the shore. Cabanas and bungalows line one side. Wooden steps lead up to the oceanfront cabanas. Each one has local hardwood furniture and a window seat. Additional steps lead to rooftop patios with hammocks, lounge chairs, and views of other islands in the distance. Instead of steps, wooden paths lead to the stilted overwater bungalows. Their patios and hammocks dangle right over the water. So where is this beach resort’s beach? There’s a long stretch of white sand on the opposite side of the island. It’s near the natural, saltwater pool. A set of swings hangs just inches above the water. While the stilted Starfish Bar sits just a little higher. This is where you’ll find light afternoon snacks (ceviche and hummus), lively happy hours (as guests return from the day’s adventures), and frozen cocktails late into the night. Why has it taken you so long to return to Belize?